As provided to the 80th Indiana Website. As enhanced by Deep Vee Productions. This photo shows him wearing the insignia (the 'shoulder straps') of a Major on his navy blue Union Army officer's coat. The caption at the bottom of the image says "George T. Simonson 80 Ind" and "Lieut Colonel." On the back are the printed words "Specialite" and "J. Perry Elliott's City Gallery" on "No. 8 Second St." in "Evansville, Ind." It is believed that he had his 'image' taken sometime between September 1862 and January 1863. An electronic copy of the original image, and written permission to post it on the 80th Indiana website, were provided courtesy of Brian and Triva Schrader. George was a resident of Princeton in Gibson County, Indiana when he was commissioned August 11, 1862 by Indiana Governor Oliver P. Morton as the Captain of Company A of the 80th Indiana. He was mustered into the Union Army at that rank for a 3 year term of service on September 3, 1862 at Camp Gibson near Princeton. The next day he was commissioned by Gov. Morton as the 80th's Major (third in command). On January 18, 1863 Gov. Morton commissioned him as the 80th's Lieutenant Colonel (second in command) to replace Lewis Brooks who had been promoted to be the 80th's Colonel (its commanding officer). Lieut. 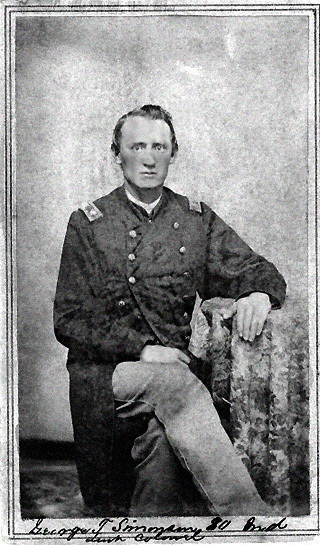 Col. Simonson resigned his commission March 13, 1863 and left the Army due to ill health. All Rights Reserved. Created December 14, 2004. Last updated December 15, 2004.